This time, I thought I'd branch out. Over the winter, I had purchased the book Preserving Food Without Freezing or Canning: Traditional Techniques , so I cracked the cover and tried the recipe for Sweet & Sour Dark Red Plums. This recipe takes 6 days to complete, because you re-boil the syrup every day for three days, then just let it sit for three days. 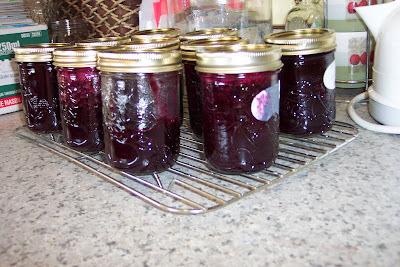 (I confess, I skipped the three days of sitting and sealed the jars while they were hot. I hope that doesn't botch it up.) I also did my nectarines à la Fruit in Syrup, which uses reduced sugar and doesn't call for a final heat processing, preserving more of the nutrients in the fruit. There were several other interesting-looking recipes which I will be trying over the course of the summer and beyond. Yup, I did make jam. Raspberry was my favorite! And canning cherries was especially rewarding when the deep, dark (COLD) days of winter prevailed! Go girl! I'm proud of you! Hmm. Maybe I'm mixing up the freezing and canning activities. The picture I have is from the trailer, so I was pretty young. Now that you mention it, I DO remember the occasional jar of raspberry jam! I've never tried making jam or canning anything. I pickled beets with Mrs Parker one time but never tried doing it alone. I do love tasting the results though!